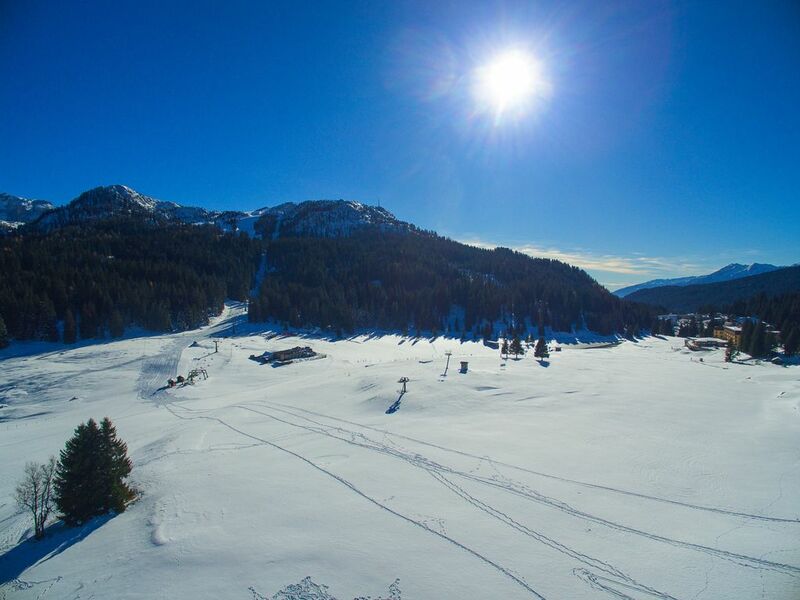 Situated in Campo Carlo Magno, a district of the famous Madonna di Campiglio, on the third floor, convenient to the main facilities and to the ski slopes which are easily accessible by walk, 1-bedroom apartment for a family or group holiday up to 6 people! The apartment, provided with free Wi-FI, welcomes guests with the bright living room with a comfortable sofa, a second sofa convertible in a double bed, armchair, flat-screen TV and dining table with chairs. The living room overlooks the private balcony with a nice view of the mountains and the ski slopes. The kitchen is fully equipped with refrigerator, freezer, oven, microwave, cooker hob, dish washer, juicer, coffe machine, toaster. The holiday apartment continues to delight with the bedroom, equipped with 2 single beds and a bunk bed. The layout of this mountain apartment is completed by the bathroom with shower, wash basin, bidet and WC. Guests can benefit of the shared laundry room of the condominium; washing machine costs 1 Euro per washing. Guests can also benefit of the BBQ shared area, available upon request and subject to availability. Guests of the apartment can easily park their car in the garage and can easily leave ski stuff in the private storage room. Pets are welcomed upon request. The apartment is close to the ski slopes in Madonna di Campiglio, as well as the city centre, shops, bars and restaurants which are only few minutes by car reachable.